Since I am usually the first one awake in the house, even on the weekend, I often sneak out and make a run to the local bagel store. I bring back coffee for Renee and 11 bagels for the family to wake up to. The 12th (and sometimes 13th) bagel is eaten by me on the drive home. However, since we are likely to be snowed in this weekend, I am making bagels at home. 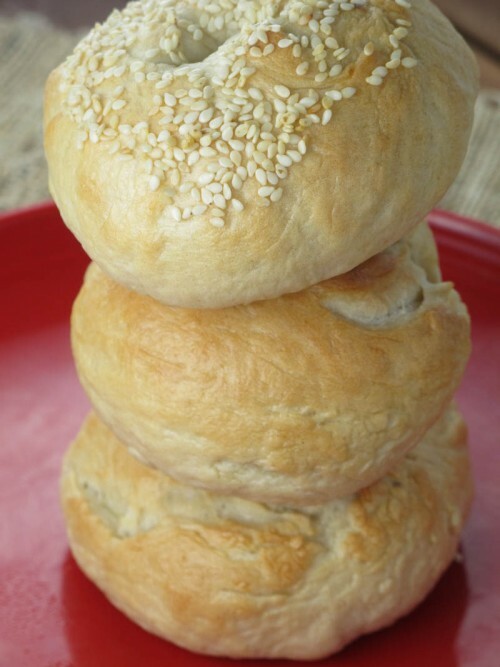 Here is the bagel recipe I use most frequently. Now, if you are getting snowed in, you don’t have to run out either! In a small bowl, using ½ cup of the hot water add the yeast and the sugar. Stir and let sit for 10 minutes until frothy. In a large bowl, combine the flour and the salt. Form a well in the middle and add the yeast mixture. Continue mixing in the flour from around the well until it is all combined while slowly adding the remaining water. Turn the dough out onto a well floured surface. Knead it for about 10 minutes until it is smooth and firm. Form the dough into a ball and place into a lightly oiled bowl, cover with a kitchen towel and let rise in a warm place until doubled in size, about 1 hour. After the dough has risen, punch it down and let rest for 10 minutes. 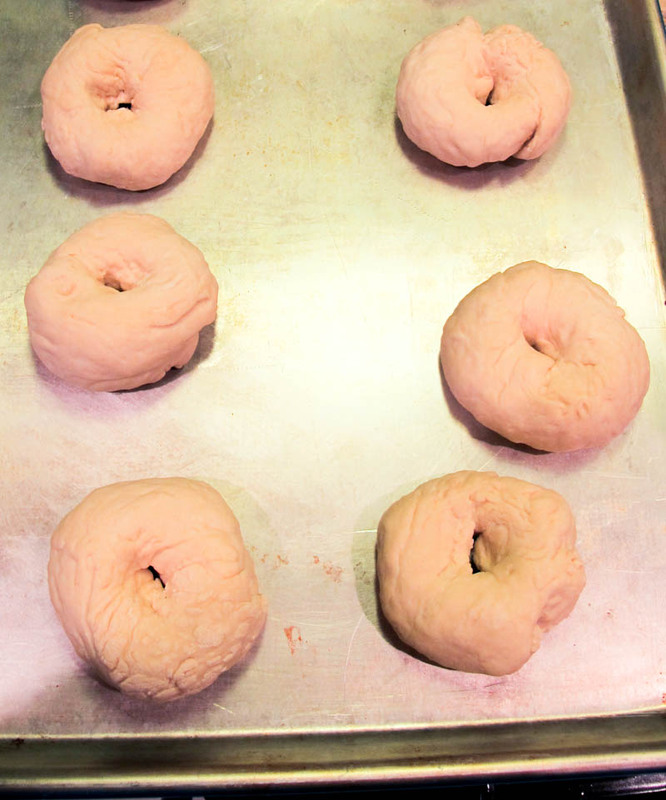 Divide the dough into 8 equal pieces (6 if you want larger bagels). Roll the pieces into balls, then push a hole through the center with your thumb, making it a bit wide. 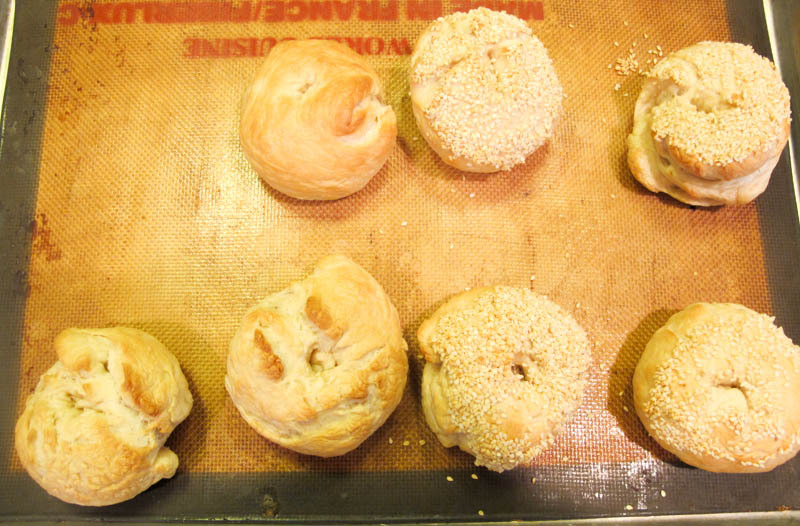 Place the bagels on a baking sheet and cover with a damp towel. Let the bagels rest in a warm place for another 10 minutes. 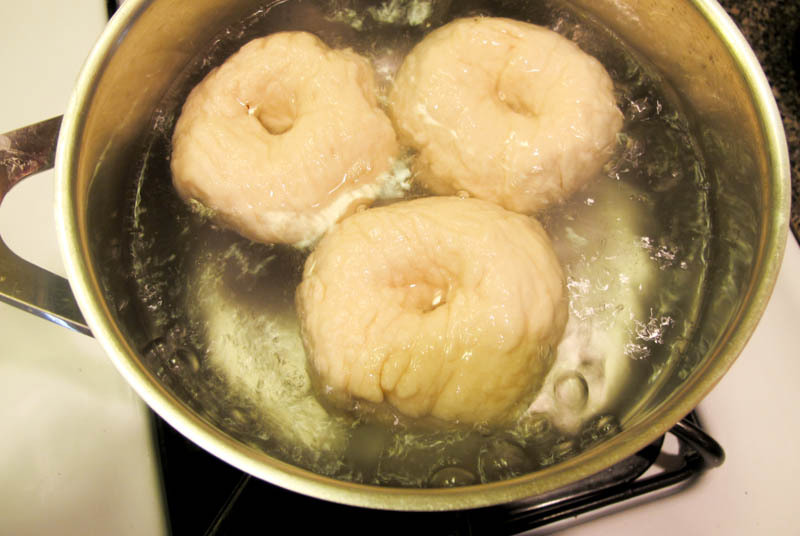 While the bagels are resting, fill a large pot with water and bring to a boil. At this time also preheat oven to 425 degrees F.
Drop the bagels into the boiling water one at a time being sure not to crowd the pot. Once they float to the top, boil for one minute, then flip it over for another minute. Remove the bagels from the water with a slotted spoon and place on the baking sheet. At this point you can add the toppings by dipping the bagels into bowls filled with your favorite toppings. The water from the boiling acts as the adherent. Return them to the baking sheet. Bake for 18-20 minutes until nicely browned. Serve with butter, cream cheese, lox or whatever else you would like! I have really enjoyed the French Fridays with Dorie cooking group. It’s been a fun way to make sure I get some blogging in each week in addition to my own (mis)adventures in the kitchen and beyond and I’ve also been able to read some really great new blogs from this endeavor. A big plus. 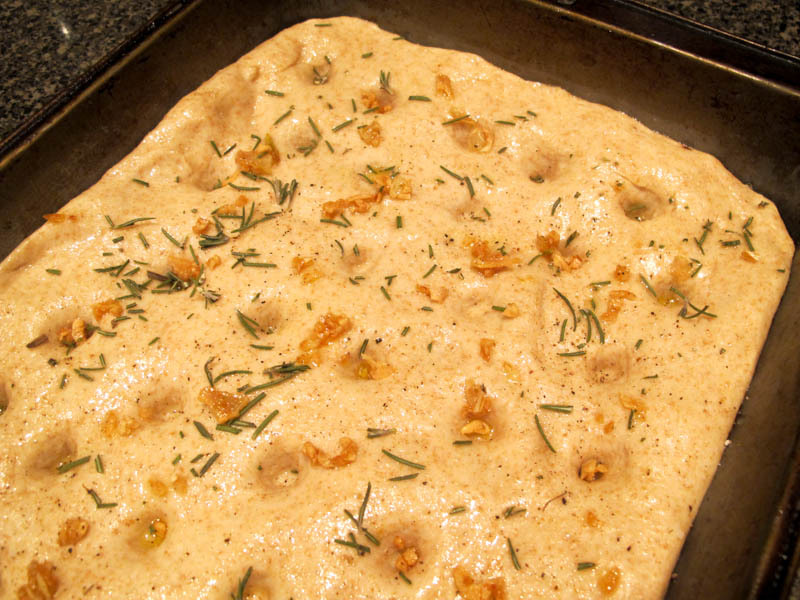 The first recipe I have joined in with is Focaccia. The host this week is Sharmini of Wandering Through. Make sure you visit her blog for the recipe and visit the LYL section of the Baking with Julia website to see how everyone else did. 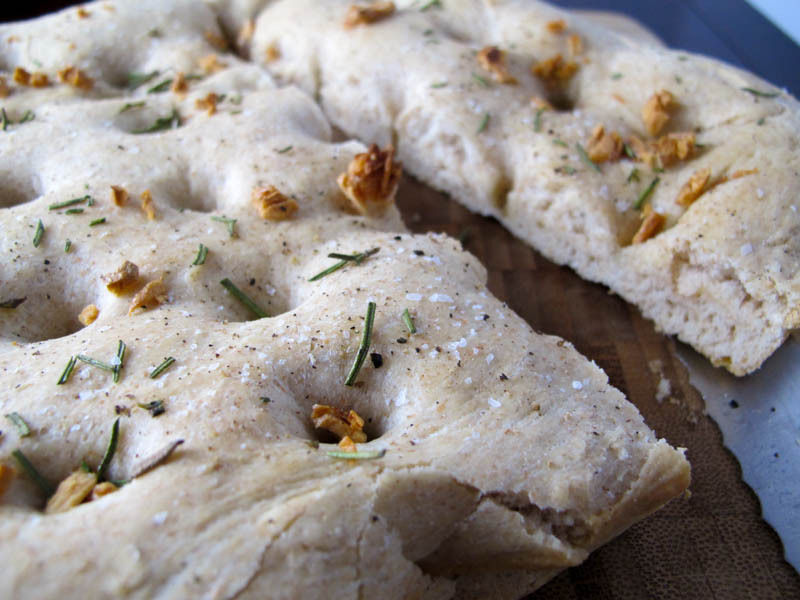 This foccaia is much like the breads we made at Kea Artisanal but with a few less toppings. In this recipe, I used some whole wheat flour as we are low on AP flour. But it didn’t affect the rise in any way. It still came out fluffy, chewy and had a nice crunchy crust. A generous drizzle of olive oil that I brought home from Puglia this summer and some roasted garlic with rosemary on top made this a wonderful meal with some sliced tomatoes and mozzarella. As with the French Fridays with Dorie group, I can’t reprint the recipe. But you can purchase the book here. Did you know that September is Food Literacy Month? Well it is! Unfortunately, too many people have been food illiterate for far too long and the consequences are devastating. It negatively impacts all of those areas but worse yet, our poor habits have affected our nation’s children. We have created an environment and an attitude where our food choices have literally been toxic and we’ve cut any form of exercise nearly out of the picture altogether. Children who are obese in their preschool years are more likely to be obese into adulthood. They are more likely to have risk factors for Type 2 diabetes, cardiovascular disease, high cholesterol and high blood pressure. They’re also at a greater risk for bone and joint problems, sleep apnea, and a host of social and psychological problems such as bullying and poor self-esteem. With the rising cost of health care, to which obesity and obesity-related conditions are costing billions of dollars each year to the strain on available and accessible health services already, this epidemic has reached crisis levels and is in desperate need of eradication. However, this crisis won’t be solved with promises of personal responsibility or by the food industry putting people before profits. It will take government, public and private partnerships to educate, mandate and essentially work to change the attitudes of how we consume. Not only how, but what, too. 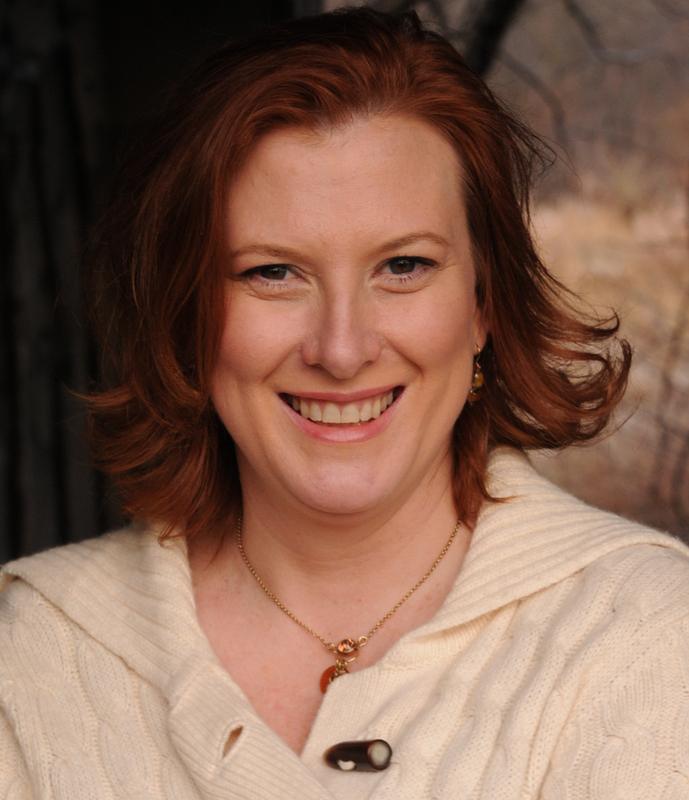 That’s where fellow blogger, Amber Stott comes in. A year ago, she founded the nonprofit organization, California Food Literacy Center. Through food literacy education they teach children about healthy eating habits and encourage them to change their attitudes towards fruits and vegetables. Reaching children early and instilling good eating habits and healthy living standards is key to abolishing obesity once and for all. They have developed a curriculum called Your Sandwich can Save the World! that reaches children through local nonprofits and schools. They test kids on their food knowledge and then work with them to modify their attitudes and behavior with informative lessons, fun activities, and by actual tastings of various fruits and vegetables. Each child is also taught how to make healthy sandwiches using locally sourced, whole grain bread and healthy fillings. The results of their pilot program have been astounding! See for yourself here. Even though they are in California, we could learn a few things here in NY from them. Check out their toolkit of ideas for the month. It’s a great place to start. So to honor Amber’s hard work and dedication to the California Food Literacy Center and in celebration of Food Literacy Awareness Month, I am making my own version of a healthy sandwich that uses leftover chicken in a way that stretches a family’s food budget even a bit further. When I make a roast chicken, there are usually some pieces left over. After everyone has eaten chicken for a day or two it’s time to transform it into something else. I grew up believing that you never throw food away- there were starving children somewhere who would love the peas that I refused to eat. I have carried that mantra well into adulthood and now, nothing goes to “waste” if it doesn’t have to. So the leftover chicken this week became a healthier version of a Waldorf Chicken Salad on a whole grain roll. In a large bowl, combine the chicken with the celery, walnuts, yogurt, mayonnaise and mustard. Season with salt and pepper to taste. Divide the two rolls into four pieces. Add the chicken salad and a few spinach leaves. Plate each half of sandwich. Serve with a side of fresh cole slaw. To make the coleslaw: Combine the cabbages, carrots, vinegar, mayonnaise, sugar. Season with salt and pepper. Place in the refrigerator for a half hour or more so the flavors meld and the cabbage softens. Please take the time to watch this video, learn more about the program and donate. All of the money raised will help educate kids about where their food comes from and how to make healthy food choices. California Food Literacy Center from California Food Literacy Center on Vimeo.